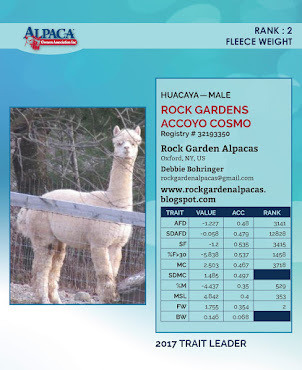 Our farm - Rock Garden Alpacas - is located in Oxford, NY. We started our adventure into alpaca farming in 2011 with 2 bred females from Ideuma Creek Alpacas, Alpavos Accoyo Sunflower Girl and Gianna's Peruvian Ivy. 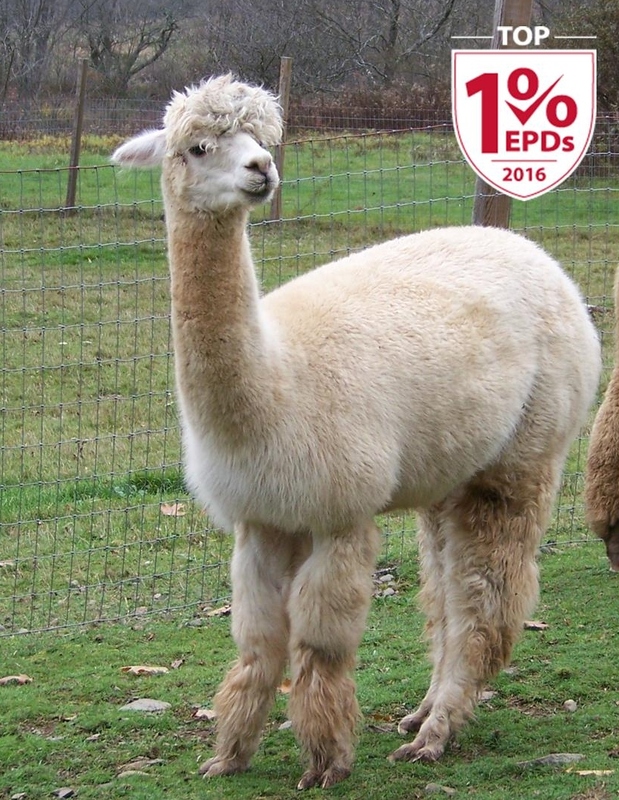 Six years later we have 15 alpacas - 10 females and 5 males plus 2 on the way for 2017. 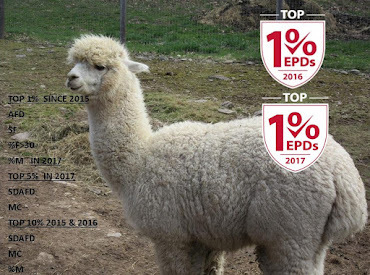 Of those 15 alpacas 12 of them are in the Top 1 - 10% of AOA's Top EPD Trait Leaders Report for 2016, with our herdsire Cosmo again ranking among the Top 5 alpacas for fleece weight. 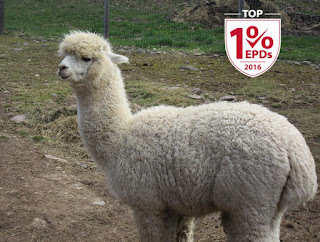 Our herdsire Cosmo - Top 5 EPD Trait Leader in Fleece Weight for 2016 and previously for 2015. 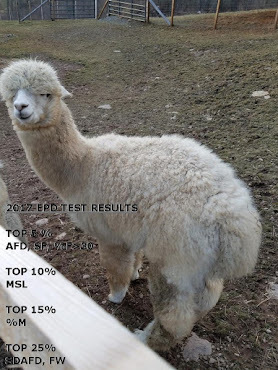 Continues to be in the Top 10% for AFD, SF, %F>30, %M and MSL at the age of 6. 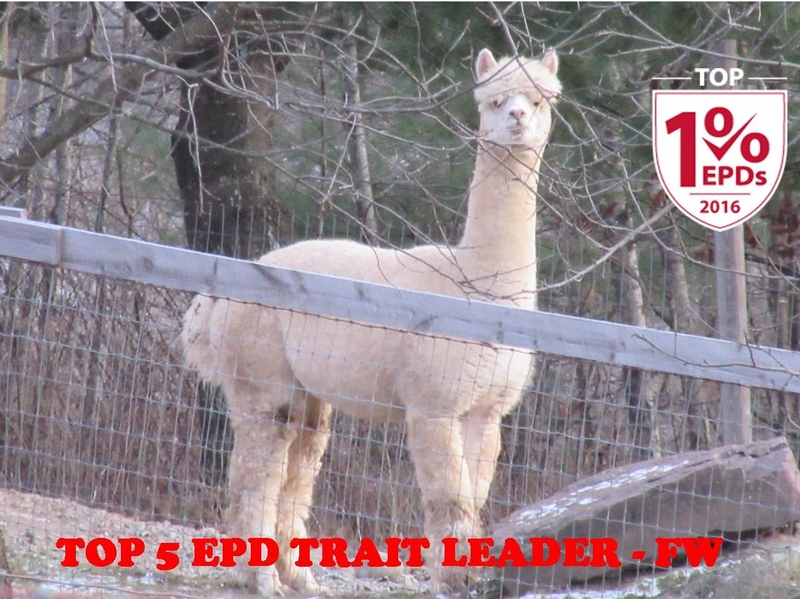 Ivy was a Top 5 EPD Trait Leader for SDAFD in 2013 and 2015, missed by 1 in 2014 (was #6) and at 10 years of age is currently #18 out of 39,442 alpacas in SDAFD placing her at the Top 1%, she also remains in the Top 1% for %F>30 and is in the Top 10% for AFD, SF, MC, and SDMC. 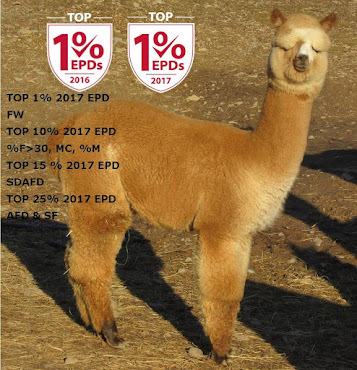 The 2015 cria of Cosmo and Ivy; Peony's very first EPD report places her in the Top 1% for %F>30 and the Top 5% for AFD, SDAFD, SF, MC and %M. We have repeated this breeding for a 2017 cria. 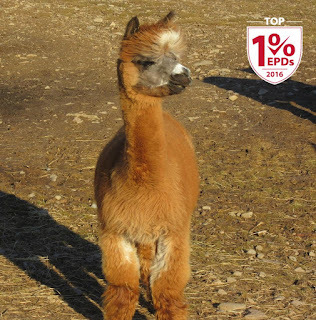 Zinnia, the 2011 cria of Ivy has consistently placed in the Top 1-10% since 2013 and remains in the Top 10% for SDAFD, SF, %F>30, and MC. 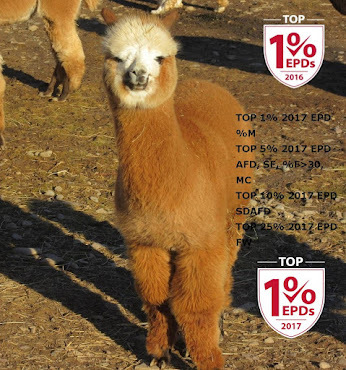 Gladiola, the 2015 cria of Cosmo and Zinnia, Gladiola's very first EPD report places her in the Top 1% for FW, the Top 10% for %F>30, MC and %M and the Top 15% for AFD, SDAFD and SF. 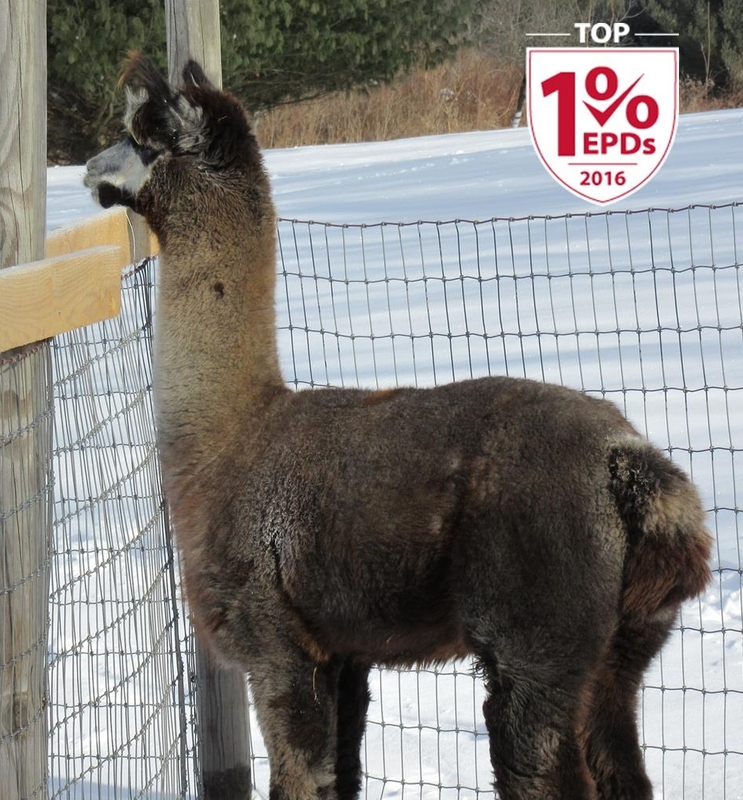 Iris, the 2013 cria of Zinnia, the Top 10% for SDAFD. 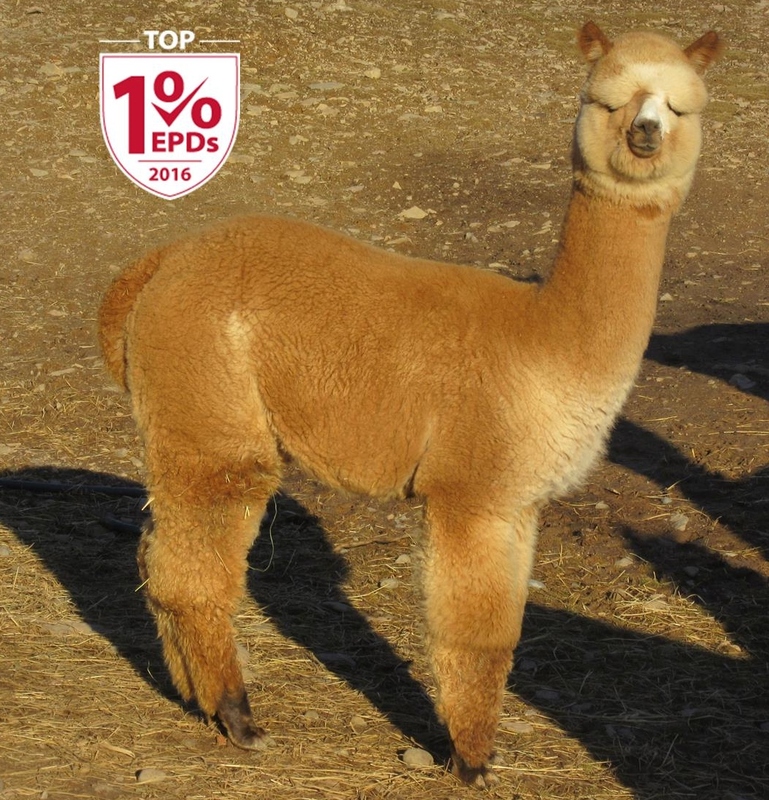 Sunflower, the dam of Cosmo, Berberis and Stachys has consistently placed in the Top 1% for MSL and FW since 2013 and is in the Top 10% for %M. 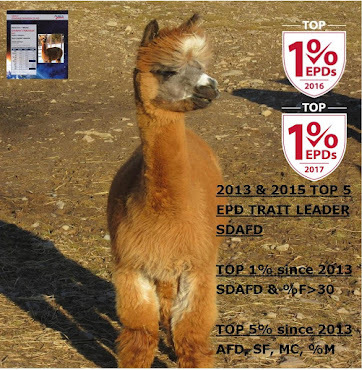 Stachys, the 2015 cria of Sunflower; his first EPD report places him in the Top 10% for AFD, SF, %F>30 and the Top 15% for SDAFD, %M and MSL. 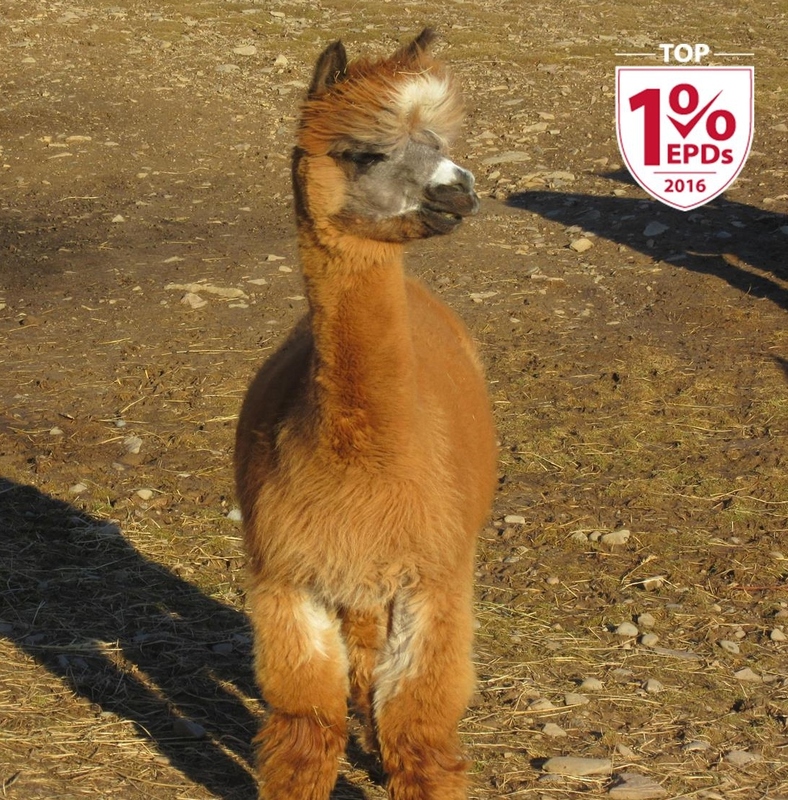 Berberis, the 2013 cria of Sunflower the Top 10% for FW and the Top 15% for SDAFD and %F>30. 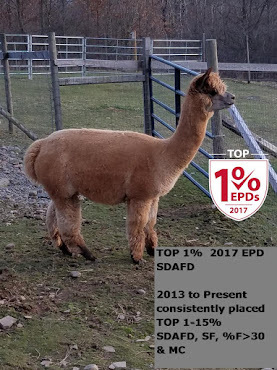 Montauk has once again placed in the Top 1% for AFD at # 92 out of 21089, SF at #113, %F>30 at #46 and the Top 10% for SDAFD at #803, MC at #675 and %M at #290. In 2015 he was in the Top 1% for AFD, SF, %F>30 and the Top 10% for SDAFD, MC and %M. 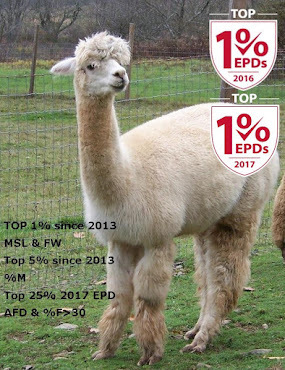 Masquerade has consistently been in the Top 1% for MSL since 2014. 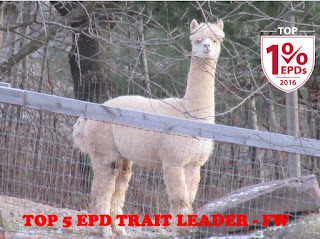 Currently at #37 out of 21089. 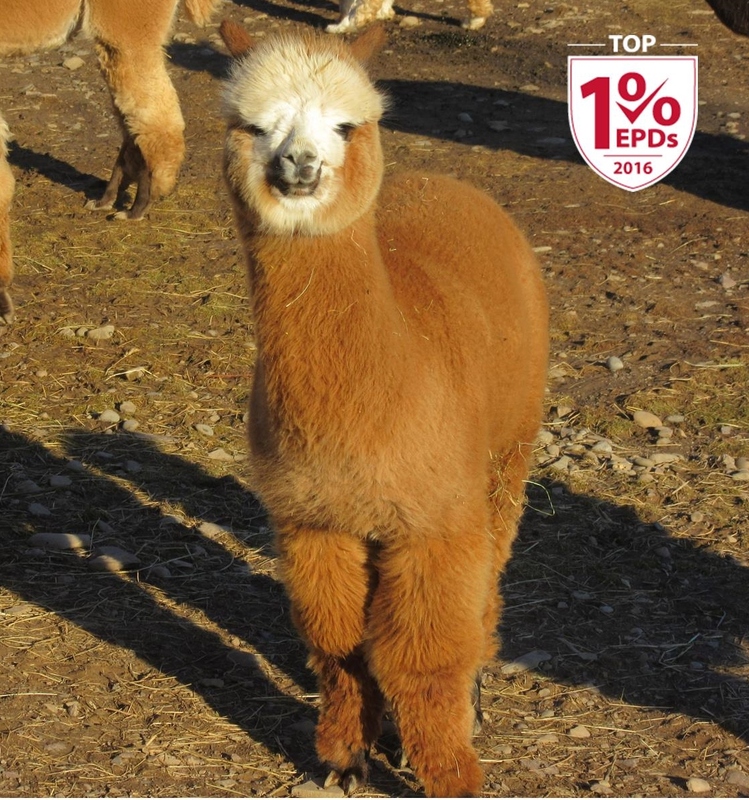 Even our 2015 cria Marigold, daughter of Masquerade, places in the Top 10% for MSL.